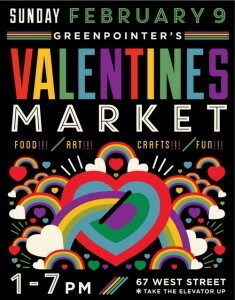 Consider Yourself Tempted… Greenpointers Valentine’s Market (Sunday, 2/10) Vendor Preview! Can you feel it in the air…? That hard-to-put-your-finger-on feeling that makes you see the whole world in rosy hues? It’s called looove, friends. 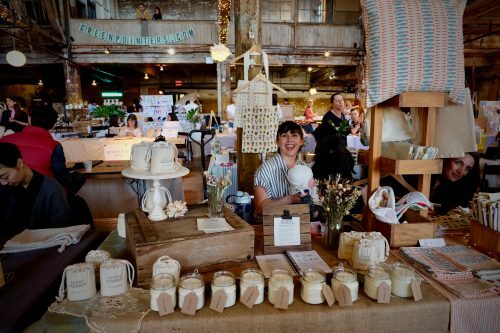 And it’s what we’re celebrating this weekend a market that takes dreamy to another level! The Vintage Rose Valentine’s Market is happening Sunday, February 10 from 1-7pm at the Greenpoint Loft (67 West St), and we’re in full-blown amore with our incredible vendors. Here’s a quick peek at some of the wares you’ll be able to shop at Greenpoint Loft!—And by the way, if you haven’t already, RSVP here! If you haven’t heard yet, we’ll be rocking out to live music by Love Always and Kendra Morris, posing in our Vintage Rose Garden photo booth, and sipping lovely local libations provided by Greenpoint Beer & Ale,Brooklyn Gin + BRINS Jam, BABE Wine, and Brooklyn Boocha. Did we mention that visitors will get to grab TWO FREE DRINKS courtesy of Cinch? As you shop and frolic, you can partake in a range of charming activities from nail art and tarot readings to floral DIY’s, face painting & much more. 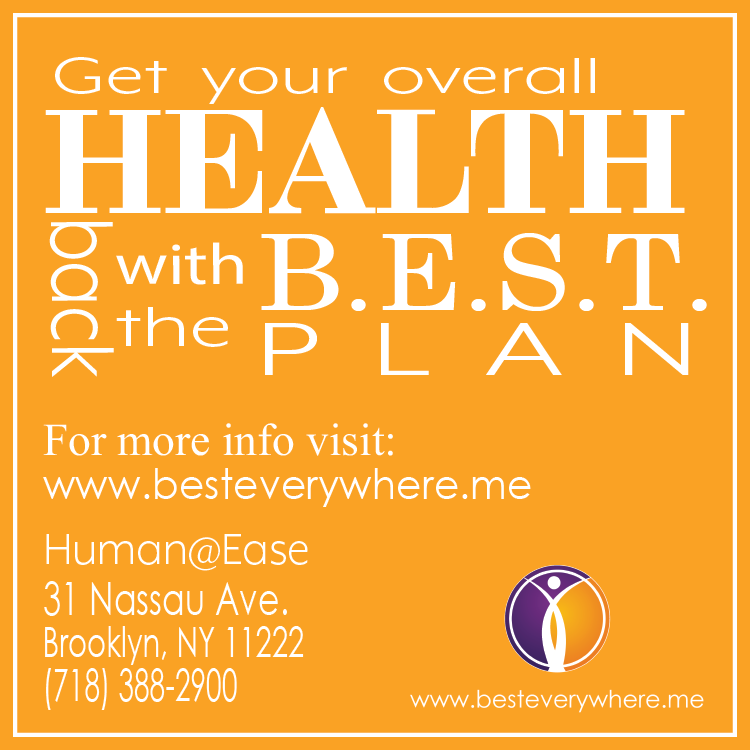 See more deets about what we have in store here. Browse some of the vendors below. We dare you not to get sweet on ’em. 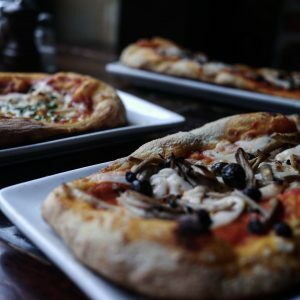 A neighborhood favorite, Adelina’s is a plant based and vegetarian Italian restaurant and natural wine bar in the heart of Greenpoint. They focus on making their food from scratch, sourcing the best ingredients and finding best small production natural wines. 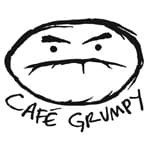 We are so excited to have them join us to serve fresh locally made Italian fare at our market! Follow them on Instagram and stop by their restaurant at 150 Greenpoint Ave if you can’t wait until Sunday! MLE integrates the artistry of old‐world techniques with modern designs, using high‐quality materials and unique details. All of MLE’s pieces are handcrafted in Greenpoint. Check out her latest creations like “A Gentlewoman’s Agreement” and other special Valentine’s pieces at our market and follow her on Instagram! 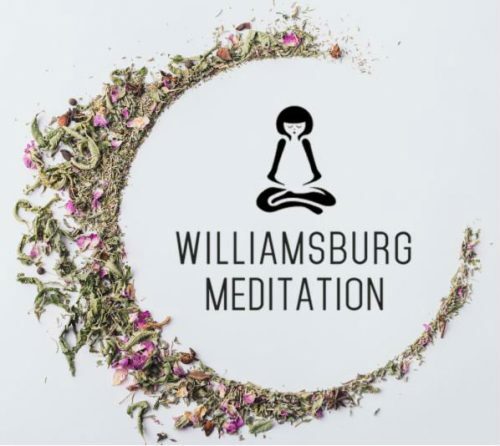 Secure your spacesuit, prepare for takeoff and get ready to blast off into the cosmos at the Greenpointers Gardens Of The Galaxy Spring Market on Sunday, April 22! The celestial happening is coming up on us fast, although there’s still plenty of time to find a pair of Moon Boots for the occasion. 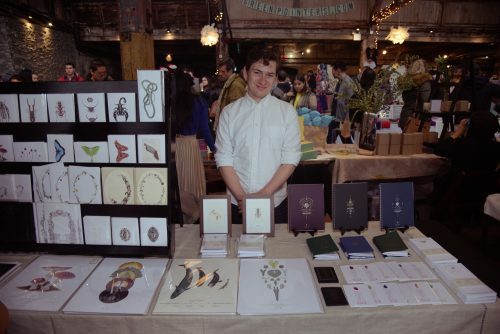 The market will go from 1-7pm in the Greenpoint Loft (67 West St., 5th Floor). Join us in orbit early by RSVPing on Facebook! It’s going to be a star-studded day with live music, free fun activities like massages, rooftop yoga henna, nail art, refreshments and food. Check out the full details of what’s in store here. 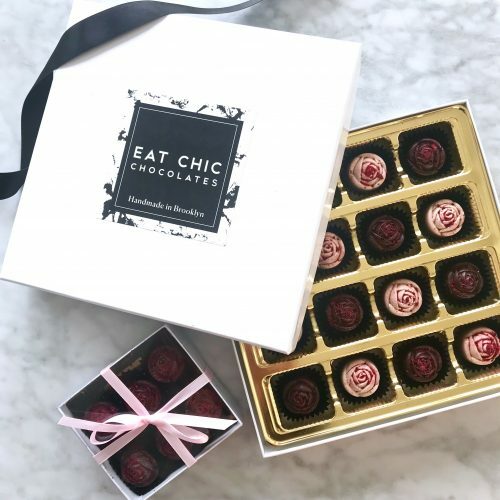 Eat Chic Chocolates is a woman-owned and operated confection brand that takes the classic chocolate peanut butter cup to the next level, using the highest quality organic craft chocolate and their own small batch nut butter fillings. Enjoy dozens of flavors, from their signature peanut butter cups dusted with Maldon sea salt, to more adventurous pairings such as lemon-poppy seed cashew butter and cinnamon-tahini. Their chocolates are vegan, gluten-free, soy-free, and palm oil-free, and they just won a Good Food Award for their commitment to making delicious and ethically-produced confections. You can find them outside of the Spring Market at these retail locations. 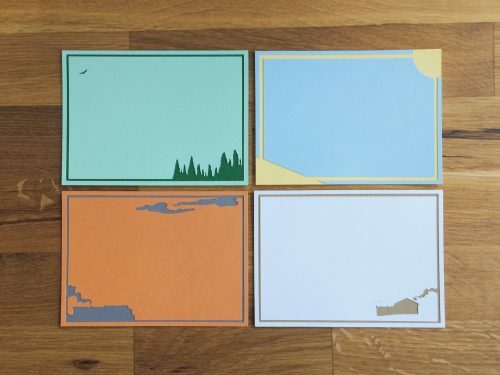 Shipwreck Press is a stationery company that wants to make your correspondence playful, beautiful, and worth keeping. Offering cards, correspondence, bookmarks, gift tags, wedding invitations and more, these handmade, cut-paper cards are detailed enough to hang on the wall, bright enough to lift spirits, and are a gift onto themselves. To find them outside of the Spring Market, you can find them online or at Wares. 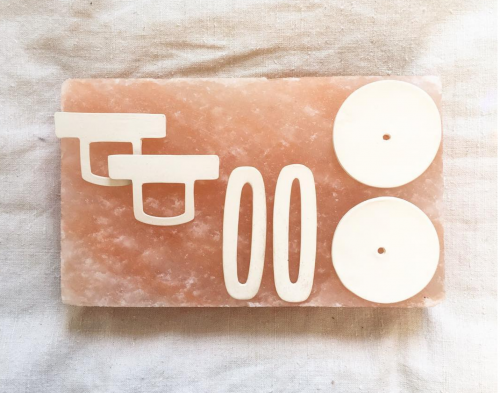 A self-taught ceramicist, this Bushwick local designs jewelry and objects that focuses on contrasting the permanency of stoneware with the fragility of form. Avery is constantly exploring new applications for clay, drawing from of fashion and new mediums to stretch what is possible for this medium. Her work has been featured in maker’s markets throughout the country and in nylon magazine. 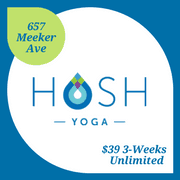 You can find her outside of the Spring Market on her website. 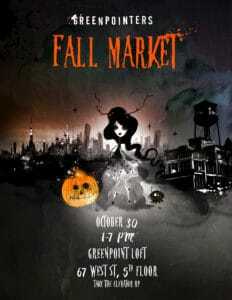 Frightfully Fun Times Coming to the Greenpointers Fall Market this Sunday (10/30)!! Preview our Vendors!! We are gathering together 50+ talented local crafters, artists, makers and can’t wait to see what they will be selling at our Fall Market! Get a glimpse of some of the unique items you will discover and join us for frightfully fun times, with warm libations, food, live music, and FREE activities! View photos of our last Fall Market and our photo booth photos! Our Fall Market is Happening this Sunday (10/25)!! Preview our Vendors!! 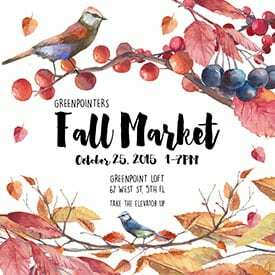 We are so excited for our annual Fall Market and cannot wait to introduce you to so many talented local creators! 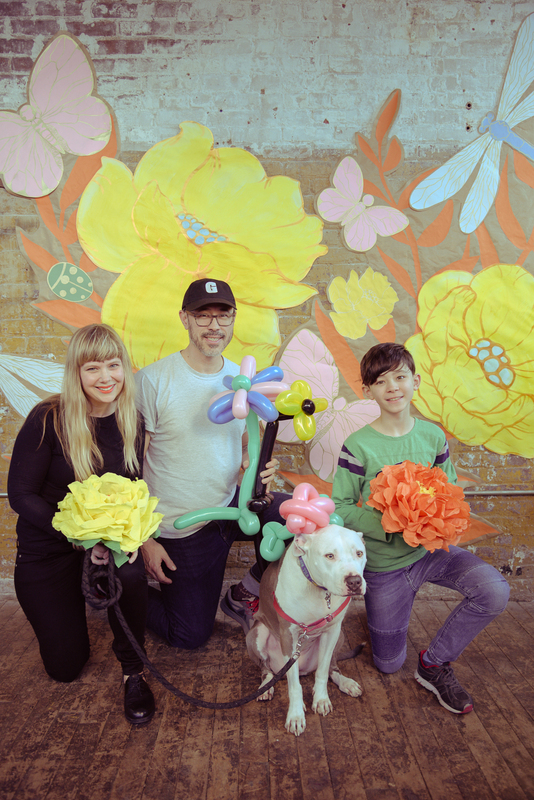 Activities (FREE): Photo Booth by Ben Shirai with “Foliage and Foragers” themed design by Libby VanderPloeg, Nail Art by @Peenk!, Tarot Card Readings by Lindsay, Face Painting by A Big Silly Guy (Roger), Henna Tattoos by Miss V, live performance by Laura & Greg! 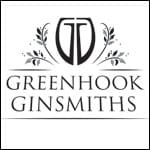 Refreshments: Craft Beer by Greenpoint Beer & Ale + Spicy Buttered Rum made with Sailor Jerry Rum and Mike’s Hot Honey + Coffee from Cafe Grumpy Coffee, and many food vendors! See below for a sneak peak at some of our awesome vendors! More details of what’s in store for Sunday here. 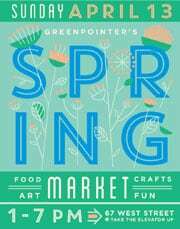 We are excited for our Spring Market and cannot wait to show you our awesome vendors! Please RSVP on Facebook ! Make sure to RSVP and spread the love! 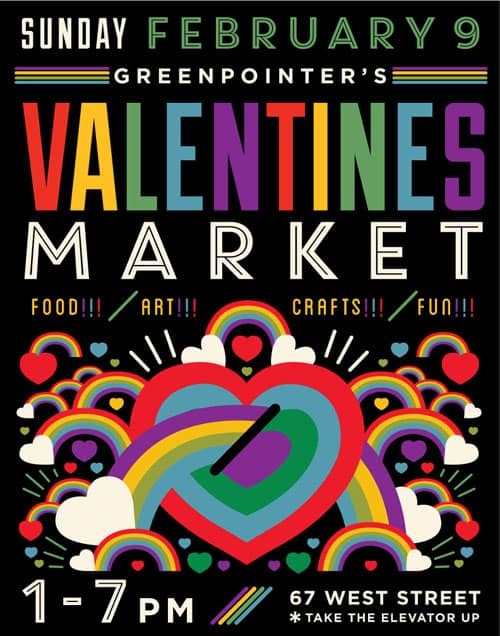 Deets: Greenpointers Valentine’s Market on Sunday February 9, 2014 from1-7pm at Greenpoint Loft (67 West St, 5th Fl).